install it and maintain it! 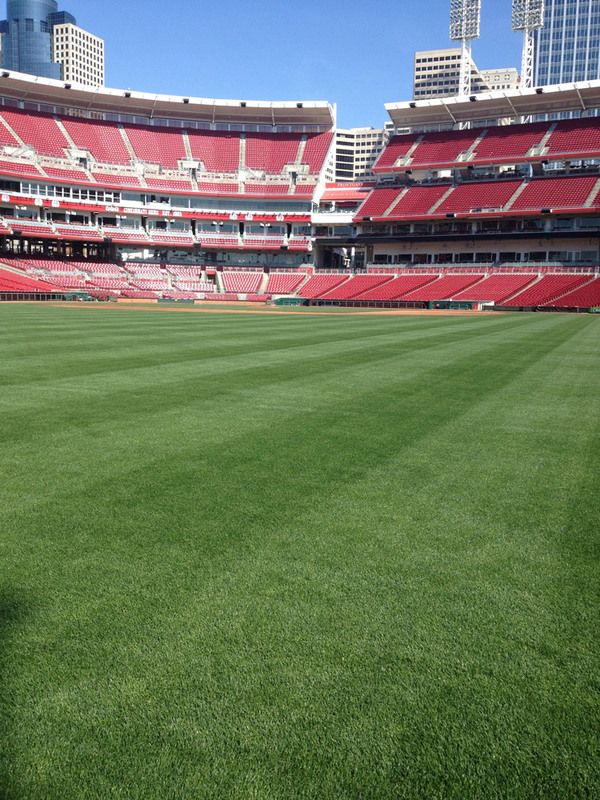 Moster Turf is proud to grow top-quality sod for athletic playing fields. 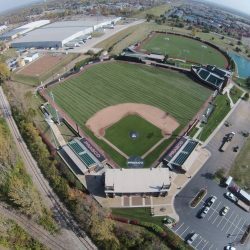 Our vast experience in planning and sod installation for athletic fields allows our clients to receive the highest quality of customer service, therefore, benefiting from a high-end field on any budget. We have grown and installed all levels of fields, including fields for professional sports, colleges and universities, high schools, recreational leagues and more. You can count on Moster Turf for the best possible athletic field and maintenance plan, and it will be built within your budget and any time constraints you may have. We also look at your current maintenance records and discuss your staff experience levels and skills to determine which areas of lawn maintenance we can assist with for an ideal playing field. We will talk about your current renovations and future care to create the most efficient and consistent surface. With this information, several options are available to achieve your expectations and stay within your budget. We, at Moster Turf, are well known for our expertise in sod installation for athletic fields. 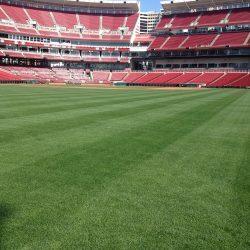 Regardless of the size of the field or the budget, we can provide high-quality lawn aeration, sod installation and anything else that your athletic field needs. We pride ourselves on providing excellent customer service for our clients, and work to find the best solution for renovating their fields to meet their needs and budget. Our Koro Field Top Maker is just one of the tools we bring to help you achieve your desired goals. No matter the scope of the work, we have the experience to help you. 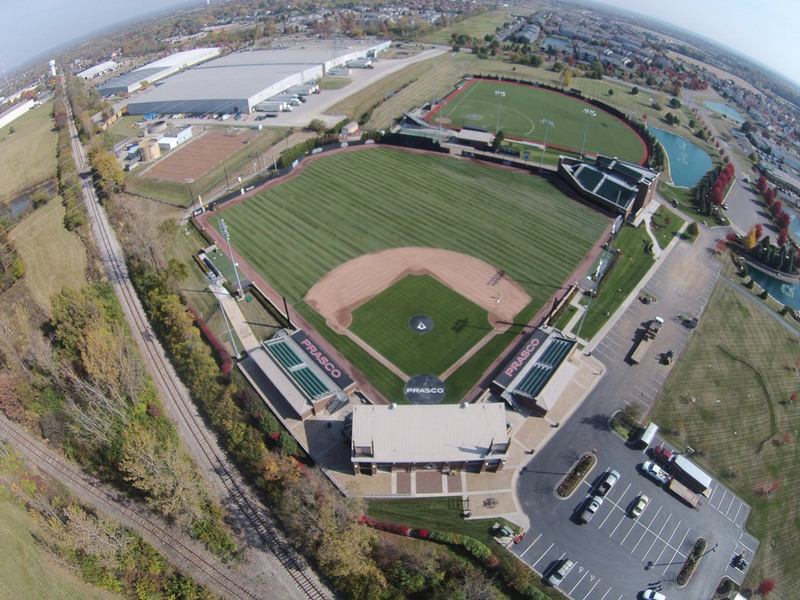 From little leagues to major leagues, Moster Turf has the knowledge and skills to work on any lawn turf from the bottom-up to keep you on time and on budget. We look at the entire scope of the project to be sure that every detail is attended to in the initial planning to ensure quality in the finished product. If we are given enough advance notice, we can grow your sod based on your seed blends selection. 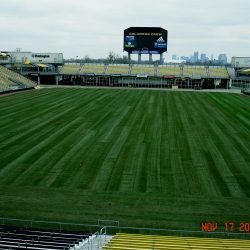 We work closely with school boards, groundskeepers and others overseeing the project to ensure that all needs are met for your sod installation. There are no surprises when you go with Moster Turf. 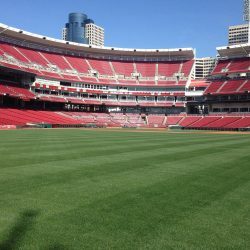 We have worked on professional fields, major university fields, college fields, high school fields and little league fields for lawn aeration, and any other lawn care service needs they may have. Lawn aeration is a very important operation that needs to be performed several times a year to help open up the soil so that air and water movement is improved. During the off-season, we use a core aerator. If the ground is hard, and when aeration is necessary during the season, we use a solid tine vibrating aerator. This loosens the soil without disruption to the playability of the field. During the off-season, the best method to bring back your field from wear is a combination of core aeration and slit-seeding. Our machine cut slits into the soil, drops the seed directly into the slits and presses the seed into the soil. This gives the seed a good soil-to-seed contact, helping with a more uniformed germination. 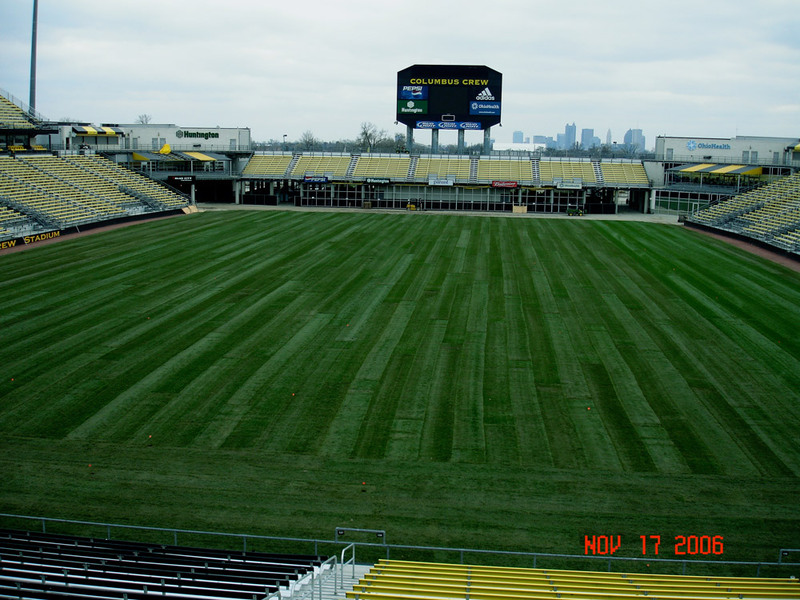 When sod is the best solution, we prefer to install big roll sod. Big roll sod has fewer seams, thus, providing faster growth. Our sod is cut and rolled into rolls 42 inches wide and up to 100 feet long. We remove any netting and make sure all seams are pulled tightly together. A well-constructed and properly installed irrigation system is a key to maintaining the quality of your field. At Moster Turf, we will customize a plan that works for your budget, field needs and ground layout. Water conservation is a high priority in our irrigation systems, so we strategically design our irrigation systems to use minimum water. 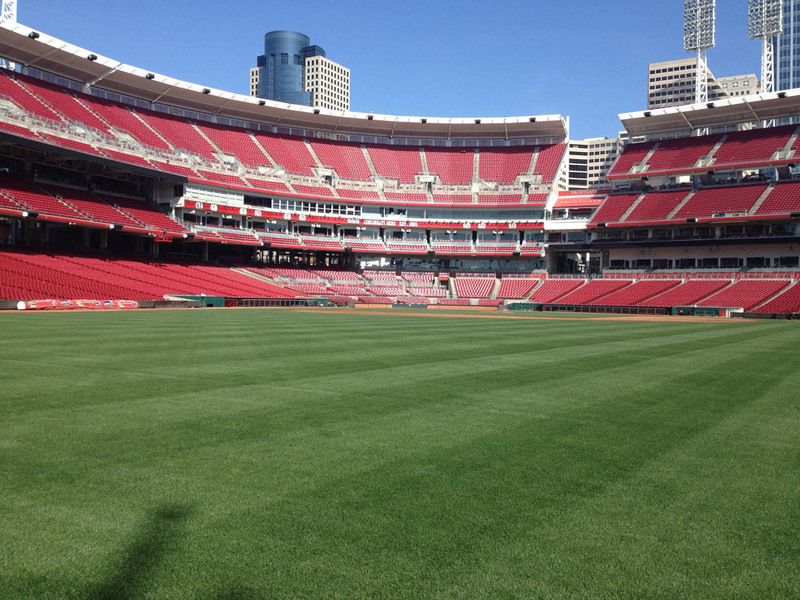 We do not overlook this critical piece to keeping a long-lasting, beautiful field. With one of the few Koro Field Top Maker machines in the area, we are able to provide a firm playing surface with no tilling and minimal grading. The Koro Field Top Maker enables us to remove as little as a thatch layer on a playing surface, to several inches at a consistent depth. This flexibility makes for a fast turn-around for grading and sodding, and getting your field ready for play. Your end product is a smooth, professional-looking playing surface. The most critical part of any athletic field is proper drainage, and this starts with proper grading. We use a laser-guided box to ensure a true proper, grade over the entire field. Moster Turf knows the importance of this step, and we take the time to make a perfect grade for seed or sod to ensure the field will perform well for many years. Moster turf can help develop a step-by step, spraying and fertilizer program with proper products to use and expert timing of the applications. However, you could choose to let our experts do the work, freeing your time for other important tasks. This book also addresses some of the most common problems we see in football, softball, baseball and soccer fields. Check it out today! Please feel free to contact us with any questions or concerns, or to get started on your athletic field!